Phillip Henry and Hannah Martin played the Exmouth Festival in Manor Gardens on Sunday afternoon. There was a big crowd - mainly families - in the gardens enjoying the good weather. The couple did a short set but, surprisingly, stuck mainly to slower material and did not make much concession to the audience which was busy chatting, eating, playing etc. As a result it was only towards the end of their set when they changed gear to more lively stuff that they really engaged the crowd - which was a pity. They played again at the Grapevine later in the evening - where the audience should be more ready to listen to Henry's spiritually-based dobro and Martin's mournful ballads. Here is a taste of their more upbeat final number on Sunday afternoon. 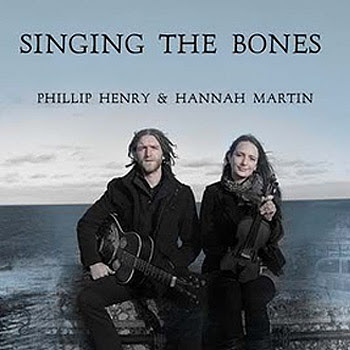 And don't forget their excellent new album 'Singing the Bones'. In contrast, Phillip and Hannah were followed by the Paul Strange Quartet - described accurately as a 'Hammond-led 60's groove band'. They delivered lively versions of well-selected material including the Boxtops' 'The Letter' and Steely Dan's 'Reeling in the Years'. The crowd loved it.